“Why fresh flours”? I would like to provide a thoughtful response. The easier part first – if you bake solely with white flours – there is not a great why fresh flours answer. It is simply not very practical to mill anything close to white flours on a home or small bakery scale. Once we enter the realm of whole grain or higher extraction flours – we can begin to explore the value of fresh milled flours. Most grains we consume are seeds. They contain fat, fiber, protein and starch. Once a seed is damaged, the oils (fats) in the seed are released. Just as with all seed oils, they will begin to oxidize and slowly go rancid. There is some debate about how long this takes, but it will depend on temperature, exposure to air and light, etc. If you purchase pre-milled whole grain flours, depending on age and how long it takes to use them… you are somewhere on the path to rancidity. Because of the oils, whole grain flours have limited shelf life – typically measured in weeks/months. In contrast, whole grains have an incredibly long shelf life… most often measured in years/decades. Advantage #2 – almost indefinite shelf life when storing actual grains rather than flours. Once the seed is milled into flour, it begins to loose nutritional value, flavor and all of the wonderful aromatics the grain has when first milled. We have become accustomed to buying wheat or farro – maybe with the distinctions of red or white, hard or soft, spring or winter. This is bit like being offered only a red apple or a green apple. In the group of red apples, for example, there are many varieties with different flavors, crunch, aromas, sweetness, etc. The same is true for grains… there are hundreds of different varieties. There are also ancient varieties such as einkorn, emmer, khorosan (kamut); durum, spelt and also is other landrace varieties. There are multiple varieties within each of these. We have lost our connection with the identities of our grains. Advantage #4 – availability of different varietals of the grains. Ability to manage choices, blends, flavors, etc. Since grains have such long shelf life, the buyer can buy larger quantities.at discounted prices with little to no fear of the grains going bad. Fresh milled grains can be incorporated in a variety of things. The baker may feel strongly about using only whole grains and avoiding white flours or they may choose to simply incorporate fresh milled flours into their baking as a replacement for some or most of the white flour. With a couple of sieves (sifting screens) the baker can also create a variety of high extraction flours. They will still contain many of the nutrients with slightly milder flavor profiles or may be used to alter the baking performance. I recognize that the decision to purchase a mill is not a simple one. There is a definite cost of purchasing the mill. The decision to become a home miller also means that you will need to discover ways to purchase whole grains. This may be pretty unfamiliar territory for many… but there are likely more options than you realize. We are in an e citing time as more and more people want to rediscover their connection to their food – know what is in it and where it came from. Fresh milled grains coupled with natural yeasts and time produce breads that nourish the body and the mind. My anecdotal story. We lived in Holland for a couple years. In the center of our town was a windmill (it was Holland after all) built in the 1600s. Almost every Saturday, the miller would arrive, the sails would start turning and fresh milled wheat, rye and corn were produced. I would often buy the fresh wheat and corn flours and made the most amazing corn breads. Upon returning to the states, I bought some WW flour and corn meal and made something that looked similar to, but tasted nothing like my Dutch cornbread. After a couple dismal attempts, I decided to mill the flours fresh and milled some hard wheat and dent corn. To my amazement and delight, the familiar flavors once again graced my kitchen. I then realized the significance of the fresh milled flours in my baked products. Thus my milling quest officially began and there has been no looking back. As with all things bread – it’s a journey. One that includes learning and discovery, some failures – but also some oh so glorious successes. As taught by Guy and Paul, you can also add other things, blue pea flowers, rosemary, spices or herbs into your grains as part of the milling process. Advantage #7 you will learn about where your food comes from, you may even meet a farmer or two and you will truly know what you are eating. Teresa edited to add: I have a Mockmill grain mill (among several other home mills). 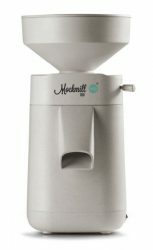 I find the Mockmill to be the best home mill I have used to date. I love how it will grind extremely fine flour, which to me is the most important attribute a home mill can have. It not only mills fine flour but a variety of fine to extremely coarse cracked grain, the full spectrum. That’s pretty handy! 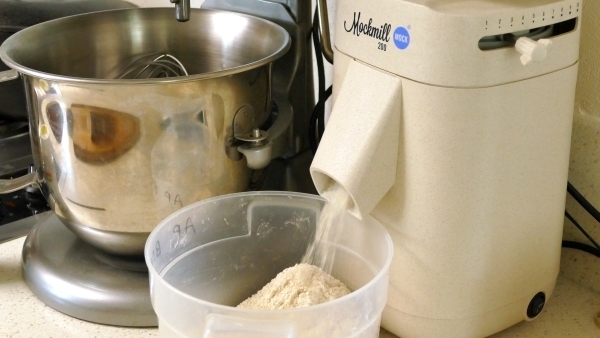 (Full disclosure, this is an affiliate link – however, I absolutely love my Mockmill, it’s my first choice in a home mill, and I wouldn’t say so if it wasn’t true).